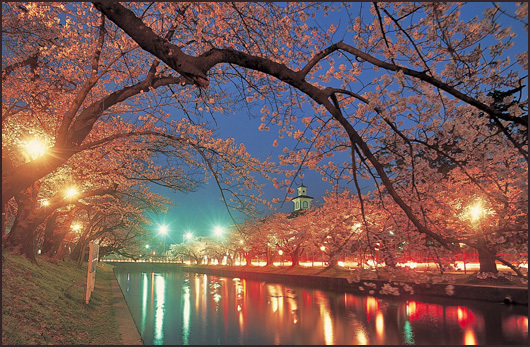 Tsuruoka City is one of the major cities in Yamagata Prefecture’s Shonai area along the coast of the Sea of Japan. In addition to bordering the Sea of Japan, the Shonai plains produce one of the best rice crops in Japan, and the Shonai area is home to the three mountains of the Dewa Sanzan, Mt. Haguro, Mt. Gassan, and Mt. Yudono. The rich natural blessings of the sea, mountains, and plains make Shonai a wonderful place for anyone to go sightseeing. In the Edo Period (1603-1868), Tsuruoka City flourished as a town built around the castle of the powerful Tokugawa family, and schools and other buildings of historical significance from the Edo era can still be found in the center of Tsuruoka City. There is a strong artistic tradition in Tsuruoka city as well. You can see performances of Kurokawa Noh, a Noh theatre troupe with a history that goes back over 500 years. 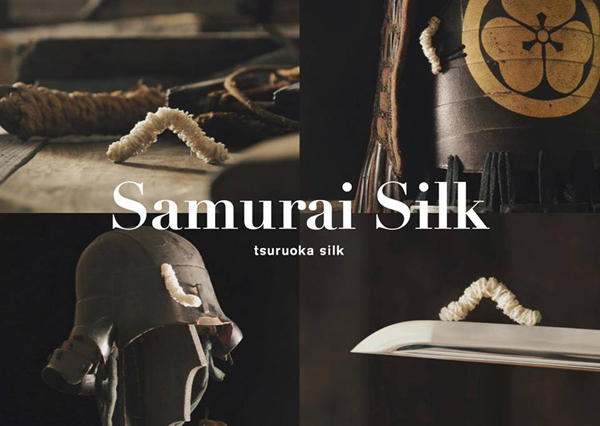 You can also experience Tsuruoka’s rich and unique traditional culture that dates back to the Edo Period through crafts such as silk goods and intricately painted candles. A number of delicious local dishes that make use of ingredients grown in Tsuruoka allow you to get a taste of the area’s unique cultural heritage.
. Station 31 - Sakata 酒田 - Tsurugaoka, Tsuru-ga-oka 鶴が岡 .
. Kurokawa Noo 黒川能 Kurokawa Noh - Introduction . Yamagata consists of four regions: Murayama, Oitama, Shonai, and Mogami. Main towns in Shonai are Tsuruoka, 酒田市 Sakata, 三川町 Mikawa and 庄内町 Shonai town. Its rice paddies extend far into the distance making it famous as one of Japan’s largest rice production areas.
. Shoonai Anesama 庄内姉様 Shōnai, from the Shonai region .
. Daihooji tsuchiningyoo 大宝寺土人形 clay dolls from temple Daiho-Ji .
. 鶴岡土人形 Tsuruoka clay dolls . First made around the year 1720 by Minagawa Juubei 皆川重兵衛 Minagawa Jubei. 酒井公 The Daimyo Lord Sakai of Shonai used to take the beautifully painted candles as offerings to Shogun Ienari 家斉 when he visited Edo. 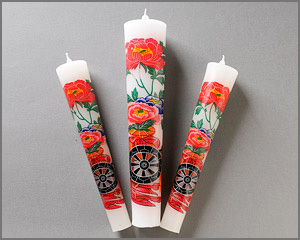 Around 1800 there were more than twenty candle makers in the region, but now hardly any remain.
. wa roosoku　和蝋燭 Japanese candles - Introduction . 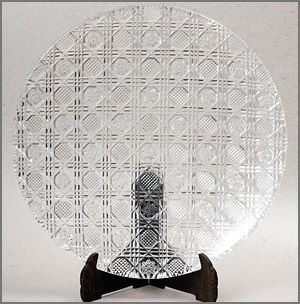 CLICK for many beautiful samples !
. temari 手まり、手毬 "hand ball" rag ball . ... a folk art form that originated in China and was introduced to Japan around the 7th century A.D.
... hirajishi 平獅子 "flat lion heads"
. izumeko ningyoo いづめこ人形 baby or dolls in a straw basket .
. kawara ningyoo 瓦人形 "tile tolls" .
. Oiran　ー Tsuruoka Oiran doll 鶴岡人形 - 花魁 . Made in Tsuruoka, Sakata and other towns in the Shonai plain.
. oshi-e 押し絵 / 押絵 raised cloth picture - Introduction .
. Oitama tsumugi 置賜紬 Oitama pongee weaving . 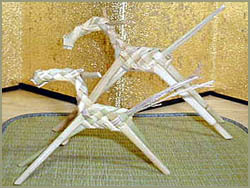 rasentsugi zao 螺旋継ぎ竿(らせんつぎざお), made first by 山内善作 Yamanouchi Zensaku. The fishing in rice field zone of Yonezawa Basin was important means of security of protein source, but in addition to it, I think about now, fishing mind of Samurai in Shonai district of Mogami River Basin mentioned below should be extended to the upper reaches. Feudal lord, stipend 14,000 rice crop, Sakai Sama ruling Shonai District encouraged fishing black sea bream to his retainer Samurai as one of military arts. Sakai Sama enjoyed fishing himself too, and fishing became prosperous among Samurai. It was for catch of the day to affect honor of Samurai. 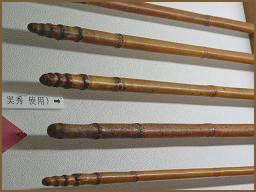 Moreover, samurai elaborated the bamboo rod themselves which was equivalent to a sword. The excellent bamboo rod is named Shonai rod all became a hand of Samurai. Bamboo for the Shonai rod is Nigatake Bamboo of thick wall, native in the district. Every samurai house used to plant bamboo bush for the materials in the garden. They dig the bamboo in winter since late fall. The reason why they dig the bamboo including root is that they use the root as one of a point of appreciation of the Shonai rod. At first, they reform a root of bamboo on the fire and dry on the shelf over the Irori hearth for four or five years and complete it. Mr. Murakami, director of Shonai Kamo Aquarium makes Shonai rod according to an ancient rite.
. wazao 和竿 "Japanese fishing rod" - Introduction . 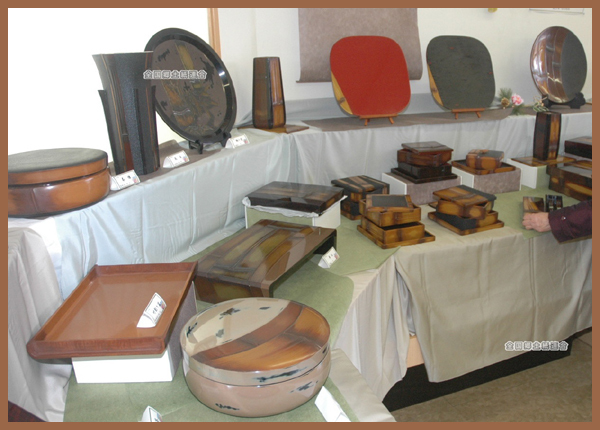 Through many layers of laquer, the beauty of bamboo is enhanced. 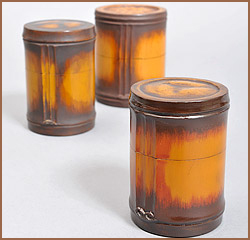 Many items have the ragged beauty of old, dry bamboo 枯れ竹, imbued with the Japanese asthetics of wabi and sabi わび さび. 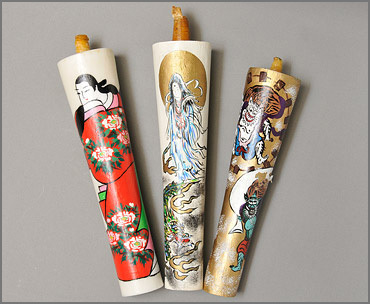 To show the beauty of the chikusetsu 竹節 bamboo joints is a special treat.
. take 竹 bamboo art of Japan - Introduction . Yamagata was the most Northern region of Japan to produce silk. The brand name is KIBISO. 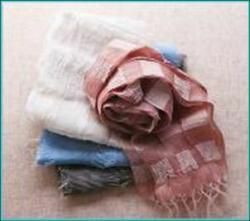 Kibiso contains a water-soluble protein called sericin, so the fabric can absorb humidity.
. kinu　絹　Japanese Silk - Introduction . 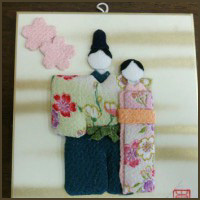 In Japan, ever since the Jomon and Yayoi periods, people have made thread from fiber derived from plants and trees that grow naturally in the mountains such as Japanese linden, mulberry, elm, wisteria, kudzu, and ramie, and used this thread to weave fabric and make clothing and ornaments for private home use. Thanks to developments in spinning technology during the Meiji period, cotton products became more common and many regions ceased producing these traditional textiles, but in this locale, it was still used for casual wear and clothing for doing agricultural work. 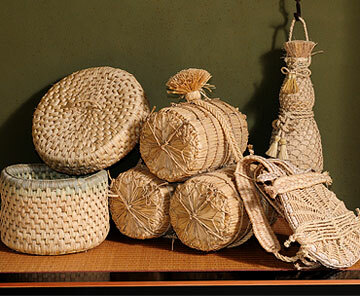 It was also in circulation as fishing nets, filtering fabric, sheets, and storage bags. 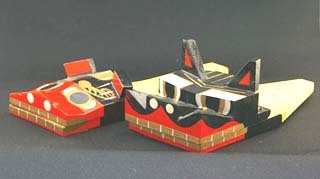 Afterwards, the development of Japan's economy and the modernization of lifestyles resulted in a sudden drop in demand, and while it barely remained in production for personal use, but since the late-Showa (1970s-80s) period, there has been an increased use of traditional crafts for regional revitalization activities as well as heightened demand for simple crafts, which has resulted in gradual expansion of production activities. The bast fiber taken from the bark of the Japanese linden, Tilia maximowicziana, and Tilia noziricola grown in the mountainous region of Uetsu is made into threads, and woven into fabric. 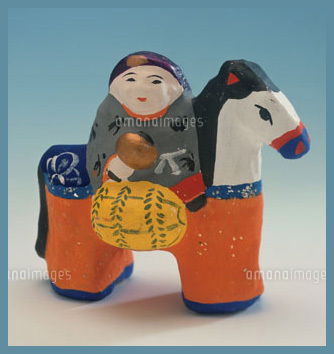 It was used for clothing and ornaments since the Jomon and Yayoi periods, and today, the tradition continues in places like the Sekigawa region of Tsuruoka City, Yamagata, and Sampoku-machi, Iwafune-gun, Niigata. 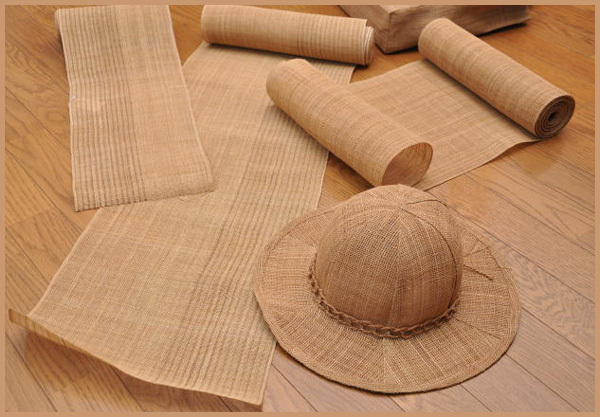 Since the raw materials are fiber from tree bark, the texture is rough, yet this rough texture possesses a characteristic stable texture, and it is made into kimono obi, as well as bags, hats, and other daily necessities. The Japanese linden, Tilia maximowicziana, and Tilia noziricola used are deciduous trees that are all part of the Tilia family of flowering plants. These trees grow naturally in the mountainous areas along the Japan Sea side and Tohoku region, and depending on the region, they are called by many names including mada, manta, mouda, and moada. The thread is made by spinning and twisting the fibers taken from the bast fiber of the trees, and these threads are woven on hand looms or treadle looms. 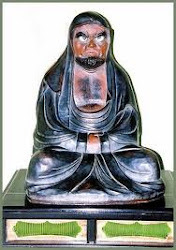 Processing of the bark fiber cannot be mechanized, and must be done by hand even today.
. Daikoku Ten 大黒天 Mahakara 大国 Okuninushi . 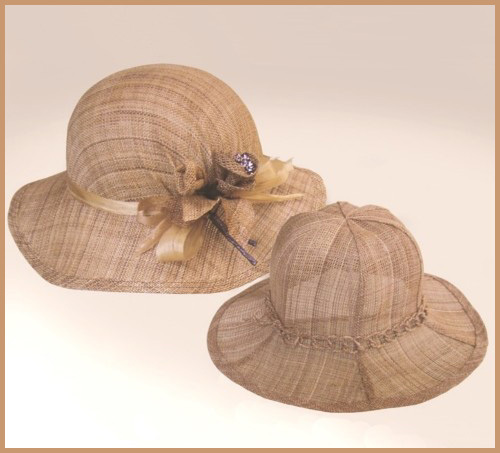 Initiated in 1985 by the 藁細工研究会 Association to foster Straw Craft to keep some old traditions alive. The rice straw is taken from Sasanishiki rice, grown without chemicals. 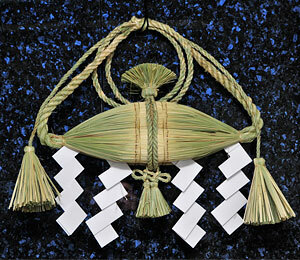 It is bound together in many traditional ways called 綯(な)う、縒(よ)る、編む、束ねる、結ぶ. The main articles are しめ縄、わら莚(むしろ)、雪靴、草鞋(わらじ)、バンドリ（背負い作業の背当）、ベンケイ（保存用の串刺し).
. warazaiku 藁細工 things made of straw - Introduction .
. Shōnai 山形 - 庄内　- 伝説 Legends from Shonai .
. minwa 民話　folktales / densetsu 伝説　Japanese Legends . .